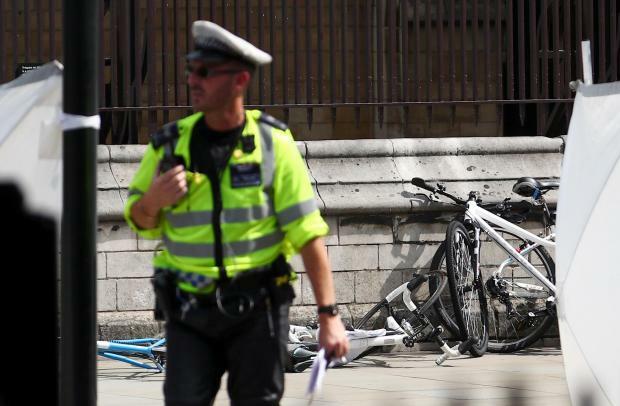 Police arrested a man on suspicion of terrorism offences on Tuesday saying he appeared to deliberately drive into cyclists before ramming a car into security barriers outside the British parliament in what appeared to be the second attack on the building in just under 18 months. 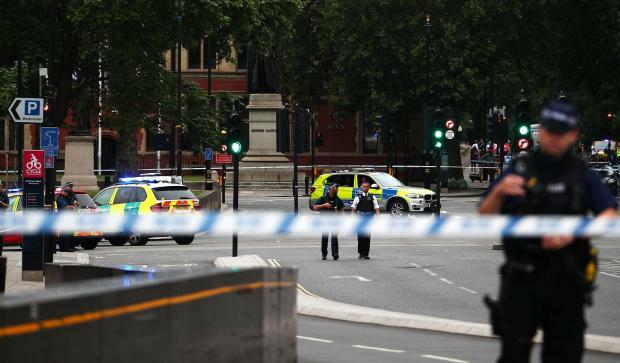 The man, in his 20s, injured three people as he drove through a group of cyclists and pedestrians before hitting a barrier outside parliament during the early morning rush hour. "Given that this appears to be a deliberate act, the method, and this being an iconic site, we are treating it as a terrorist incident," London Assistant Commissioner Neil Basu said. Basu said the man was not co-operating with police. He was not believed to be known to security forces, he said. None of the injuries were life-threatening, officials said. Malta's Foreign Ministry said that it had no reports of any Maltese being among the casualties. The country's High Commission in London was available to offer any help needed to Maltese nationals, the ministry added. Police said a silver Ford Fiesta collided with a number of cyclists and pedestrians before crashing into barriers outside the Houses of Parliament at 0637 GMT. "The driver of the car, a man in his late 20s, was arrested at the scene by armed officers," police said in a statement. "He was arrested on suspicion of terrorist offences. There was nobody else in the vehicle, which remains at the scene and is being searched. No weapons have been recovered at this stage." In March 2017, Khalid Masood, 52, killed four people on nearby Westminster Bridge before he stabbed to death an unarmed police officer in the grounds of parliament. He was shot dead at the scene. 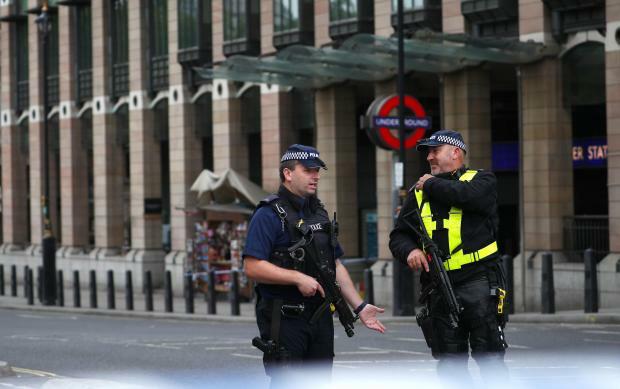 It was the first of five attacks on Britain last year which police blamed on terrorism. London's Ambulance Service said it had treated two people at the scene on Tuesday and they had been taken to hospital. A third person with minor injuries was assessed at the scene. 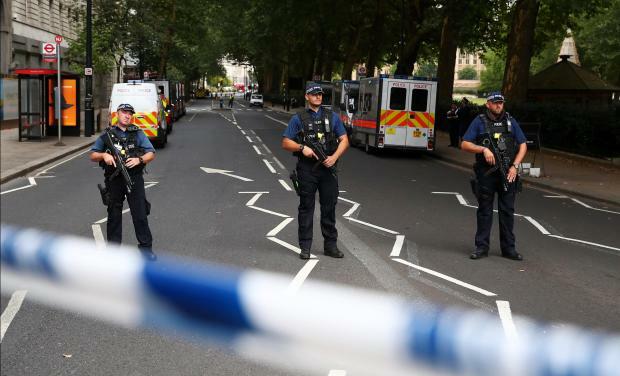 Armed police swarmed the scene and cordoned off a large area around the parliament in central London, usually bustling with tourists and government workers. "It's a very serious incident," witness Jason Williams told reporters. "There was smoke coming from the vehicle." Camera footage showed the vehicle taking a wrong turn into a group of cyclists waiting at a traffic light before veering across the road and into a lane used for accessing parliament where it struck a barrier and came to a halt. Government security officials were due to hold a meeting of their emergency committee at 1300 GMT to discuss the incident. Images shot by a Euronews journalist showed police pointing their guns at the vehicle shortly after the crash. Footage on social media showed a handcuffed man being led away by heavily armed police. Other footage showed a cyclist lying on the street. 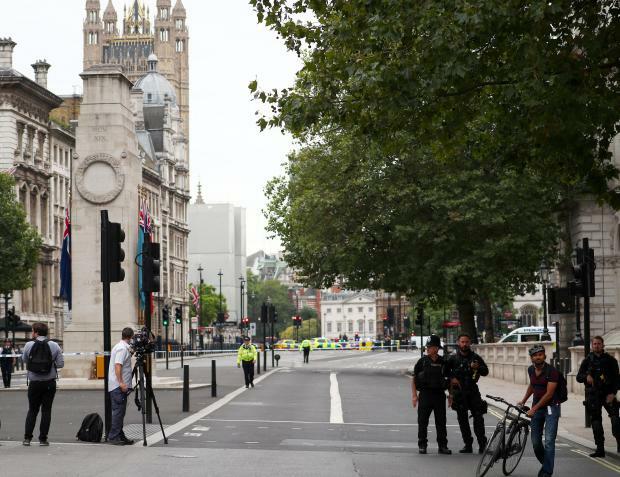 British Prime Minister Theresa May, who like other lawmakers is on holiday during parliament's summer recess, said her thoughts were with the people injured. Britain is on its second-highest threat level of "severe", meaning an attack is considered highly likely and the authorities say a dozen Islamist plots had been foiled since Masood's attack in Westminster last year. Last week, a Muslim convert admitted plotting to kill more than 100 people by driving a truck into pedestrians on London's Oxford Street, the capital's major shopping thoroughfare. In October last year, 11 people were injured when a car collided with pedestrians near London’s Natural History Museum, raising fears of an attack, but police later said the incident was a road traffic accident.